Topics: Automotive Systems, Services, Recruitment, Bloomfield Web Design, and Uk. bloomfieldwebdesign.co.. 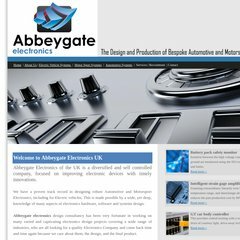 Web Design Company | Bloomfield Web Design | Sudbury | Bury St ..
Abbeygateelectronics.com's server IP number is 82.165.115.71. It has 2 DNS records, ns67.1and1.co.uk, and ns68.1and1.co.uk. It is hosted by 1 1 Internet Ag Baden-wurttemberg, using Apache web server. PING www. (82.165.115.71) 56(84) bytes of data.